Kalynn: Now I would like you to talk to me about the Internet of things. First of all not everyone will have heard that term so describe what that means and what it means to us as businesses. Laurie: Exactly. Internet of things is really interesting, and you’re right, a lot of people have no idea what it means and even if they have some kind of glimmer of an idea that’s kind of where it stops. The IT vendors out there and the prognosticators have been forecasting very big growth, or intelligent connected devices of all types, so think anything from Apple Smart Watch or Google Glass to sensors and manufacturing equipment or maybe you’ve heard of these smart parking meters. The whole idea between internet of things is that you can have these devices kind of seamlessly connected, and you as a user, you don’t have to necessarily do anything but the device is doing something for you. An easy to understand example is something called Tile, which is a little thing you clip on or paste on to your keys or your glasses or something like that, and when you can’t find those things you can get a signal from that tile as to where they are. Kalynn: Oh that’s brilliant. I hadn’t even heard of that. Laurie: Kalynn, it’s probably a must for us Baby Boomers, right? Kalynn: Wow. I have a husband and three sons. Of the four of them, three of them lose their stuff all the time. Laurie: You know, I really think, obviously for Baby Boomers this is probably going to be a huge hit, right? Kalynn: Yeah, I love that idea. Laurie: They’re inexpensive. I’m trying to think, I think they’re like $24.99 or something, but it’s a great way to find your stuff. Kalynn: Now you know what? I’m even thinking that you could attach this to your dog or cat’s collar or to a tag? Laurie: I don’t know what the limits are, but it’s pretty much designed for the stuff that we misplace, but I guess our dogs kind of misplace themselves. Kalynn: Especially cats, they like to hide and you don’t know where they are. Laurie: This is just kind of just starting to really spark imagination in the consumer end of things. People are starting to get an idea of things like this and smart watches, and FitBits, those are another smart device, right? But I think a lot of small, medium business owners, they say well what does that have to do with my business? I don’t get the business case for me, right? We’re starting to see some use case scenarios come out that I think just like Tile or FitBit does in the consumer space bring this into better focus to have people start getting more ideas about how they could use internet of things. For instance, a couple of the examples I mention in the report are RFID, Radio Frequency Identification, which has been used in logistics and packaging and all that kind of thing, distribution for a long time. It’s usually been used in kind of closed loop systems for more high value goods because it hasn’t been necessarily easier and cheap to implement. With internet of things technology it will really bring down the cost and make it more practical let’s say for a small retailer to use it so they could track everything with devices that would be in concept very similar to something like Tile with RFID capabilities that would give them better inventory accuracy, if something is purchased in the checkout it would deplete the supply by one, and also of course help them reduce theft. Another idea I like is this whole idea of beacons. Not only could you use beacons in stores, beacons are like indoor positioning systems that communicate directly with the smart phone or other computing devices via computer. Somebody was telling me the other day about a trucking company that is installing beacons. They have a fleet of about 100 trucks and the beacons are set up to monitor all kinds of things like fuel, mileage, and when maintenance is due and inspections are due. This can really help this company reduce their vehicle downtime and cut costs. I think we’re still very early going but I do believe in 2015 we’re going to see a lot of examples of SMBs putting Internet of things to work and getting value. I think one of the neat things about it is that with the Internet of things you as a user, once you deploy the solution, you don’t have to do much. For instance in that trucking example, the trucker doesn’t do anything, this thing is just hooked under the dashboard and that’s that. You don’t have to worry about user adoption and will the user learn to use it and like it and all that. I think at the end of the day this could be a really great area for small businesses. The trick will be a lot of this will probably be industry specific, so you have to see what are other people in my industry doing and that might help a lot of small businesses get good ideas. Kalynn: You’ve already got my brain sort of turning because the trucking example reminded me, I have a car for the first time that has OnStar. People have either owned that kind of car or they’ve seen commercials on TV but the OnStar system sends me emails when my oil life had reached a certain level in the car. It sent me an email and said you really need to change your oil and stuff like that. I’m realizing that there are certain kinds of small businesses like HVAC contractors and businesses of that nature. It helps them, not just when someone has an emergency and they need you to come in, or you get a big project and it’s one time construction, but it’s the maintenance of people’s systems. Laurie: Maintenance of anything really, vending machines, whatever, it just holds huge potential to change the way you get information about devices so you can service them. Kalynn: You can be proactive. Laurie: Yes, keep them shipshape. 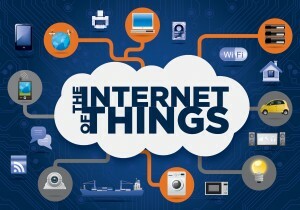 Pingback: Internet of Things and the SMB | Business. Fitness. Technology. vincula esto con con fleet management zagreb?